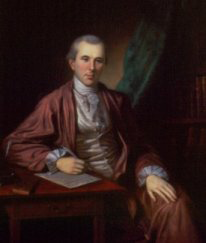 At the time of his death, Dr. Benjamin Rush -- along with George Washington and Benjamin Franklin -- was arguably one of America’s three most notable men. He was a signer of the Declaration of Independence, helped found five colleges, served under three presidents, and personally trained more than 3,000 medical students. He is also the founder of the Sunday School movement in America as well as the first Bible society in America. He published the first American textbook on chemistry. He was active in the Sons of Liberty in Philadelphia. In June 1776, he was elected to attend the provincial conference to send delegates to the Continental Congress and was appointed to represent Philadelphia. In 1777, he became physician-general in the Continental Army but became critical of the administration of the army medical service and Dr. William Shippen, who was in charge of it. He complained directly to General George Washington who deferred to Congress. Congress supported Dr. Shippen, and Dr. Rush resigned. As the war continued, he tried repeatedly to get Washington removed as commander-in-chief. He even went so far as to write an anonymous letter to Virginia's governor, Patrick Henry. He was confronted by General Washington, and that confrontation caused him to remove himself from all war activities. In 1789, he wrote in newspapers of Philadelphia advocating the adoption of the federal Constitution. He was elected to the Pennsylvania convention and had a hand in adopting it. From 1797 to 1813, he was treasurer of the US Mint. On March 28, 1787, he wrote an open letter “To the citizens of Philadelphia: A Plan for Free Schools”. "Let the children...be carefully instructed in the principles and obligations of the Christian religion. This is the most essential part of education. The great enemy of the salvation of man, in my opinion, never invented a more effectual means of extirpating Christianity from the world than by persuading mankind that it was improper to read the Bible at schools." "The only foundation for a useful education in a republic is to be laid in religion. Without this there can be no virtue, and without virtue there can be no liberty."